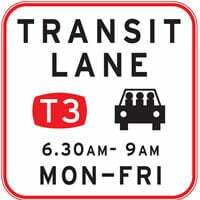 On a Transit Lane sign, what does T2 mean? On a Transit Lane sign, what does T2 mean? This is a transit lane which can only be used by passenger service vehicles, cycles, motorcycles and vehicles carrying at least two people. T2 means that the lane can only be used by vehicles with 2 or more occupants. In the case of high occupancy vehicles a transit lane will either be T2 for a minimum of two occupants per vehicle, or T3 for a minimum of 3 occupants per vehicle. Can trucks, utes and commercial vehicles use transit lanes (T2, T3)? Trucks, utes and commercial vehicles can use transit lanes if they have the required number of occupants, i.e. 2 for a T2, or 3 for a T3. The markings will be painted on the road. The image below is from the Mt Wellington on-ramp in Auckland showing that this lane is reserved for vehicles with two or more occupants, and trucks. As trucks are specifically mentioned, they are exempt from the two-occupant rule. Road markings will be accompanied by a sign. In the case of the sign below it is a general T3 (three or more occupants sign) applying to all vehicles, including trucks and commercial vehicles, but within the times of 6:30-9am Monday to Friday. If a transit lane is being monitored then you will need to ensure that your passengers are visible - this has been an issue in the past with parents carrying young children and them being difficult to spot in vehicles with tinted glass.